Since visiting Chartres some years ago, work has taken place to restore the clock there to its former glory. 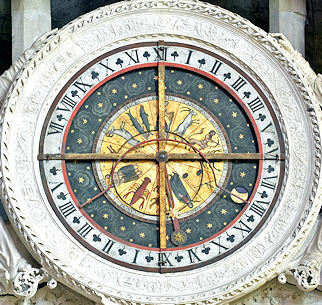 On the Dark Star website, I discussed how the clock featured two Suns, and how Chartres was a centre of heretical imagery within the Gothic mediaeval tradition of cathedral building. The cathedral features many anomalous statues, a remarkable Black Madonna (featuring its own Dark Star imagery) and its famous contemplative maze. "The Sun is not at the centre of the clock. Note that restoration includes a "second sun" on the same "hand" or pointer. The outer one that you have presumed to represent the Dark Star represents the daily position of the sun in the sky. It rotates through 24 hours - 2 x 12 as shown , in which the trefoils represent half-hours. The blue starry circle rotates showing the position of the moon in the zodiac, and the lunar phase, by the changing shadow that covers the moon while it rotates. 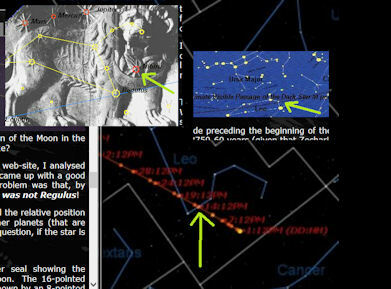 the zodiac ring rotates at the rate of a sidereal day, compared to the tropical day rotation of the solar pointer. The circle you defined as the ecliptic is just that... and the inner sun that slides up and down the pointer shows the position of the sun on the ecliptic as it moves through the zodiac. The red semi-circle between the VIII and IIII represents the position of the horizon at Chartres and indicates the rising and setting times of the Sun at the points where the inner sun crosses horizon. The sliding sun on the pointer also indicates the changing distance from sun to earth over the year, and thereby, the seasons." "Sun at 11.20 p.m; waxing crescent moon in Libra; Sun at the end of Leo, on cusp with Virgo. Sunrise about 4 a.m; sunset about 7.40 pm local time." But, saying that, esoteric thinkers have a way of hiding heretical information in plain sight. It remains the case that the pointer depicts two suns. They might both depict the Sun within different contexts, but the original creator of this remarkable Zodiac still chose to show two suns rather than one, which he could easily have done here. Given the broader context of Chartres' mysteries, that still leaves the original meaning of the clock's depiction of two suns as an open question in my mind. "I was going back through your dark star pages, mostly because there are just so many visual goodies in there! I happened upon the picture of the lion statue with the extra star. Re-read that section and a few others but wasn't really looking for anything in particular. Later that same evening I decided to get an update on when ISON may be visible to the naked eye. I was absolutely shocked to see that ISON was going to pass through Leo, and that only recently as it passed through Leo was it viewable by the average amateur astronomer. "Not only has the path been travelled before, but ISON is also coming in at an interesting angle, much like you described a possible dark-star orbital path in one section of your work. Now... if the dark star was to follow this same path, and being about the size of Jupiter or bigger, would it not start glowing and gathering attention as it passed through Leo? Would Leo then not be "glowing", as is mentioned in your section called 'The Reddening"? I would assume a planet the size of Jupiter using ISON's track would be putting on a spectacular show right now! "Now, if that extra star was just ISON many moons ago, would they not have instead drawn a comet tail instead of a plain old star? I assume by the position of the other three assumed planets, an exact date could be determined of that particular alignment? Would this give any clues to a possible orbital path of the dark star if ISON was merely caught in the Lagrange point along with all the other comets and the one air-burster we had?" These are certainly fascinating points. The possibility that Nibiru reappeared in our skies around the time of Christ is still one that consider a possibility - that the return of Nibiru was the 'Messiah' that had been keenly awaited for some time, appearing as a royal star, and interpreted as the Messianic Star at Christ's birth. Could ISON be part of that story? Well, the problem straightaway is that ISON is considered to be on a hyperbolic trajectory. 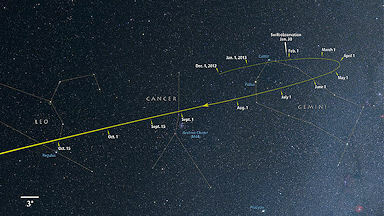 It is a 'new' comet, one that has emerged from the distant Oort Cloud for the first time. It will graze past the Sun before being ejected from the solar system (if it survives the perihelion passage intact, that is). It may become quite bright at some point, although that is by no means certain. But historically, it doesn't seem to have played any part, and is disconnected from any orbital path that the Dark Star may be on. Unless, that is, its plunging towards the Sun might have been triggered by the Dark Star itself, providing us with yet another example of the non-random patterning of long period comet appearances described by Professor Matese et al. It's made a lot of enemies in high places recently, but I love The Guardian newspaper. Except for one thing - its coverage of UFOs. For a paper that likes to break down government secrecy, it seems rather naive when it comes to the subject of UFO cover-ups, promulgating the mainstream perspective with some vigour. 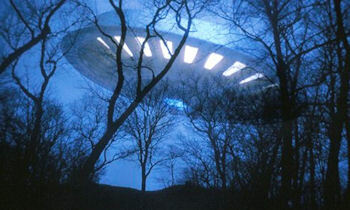 A couple of years ago I wrote to columnist Simon Hoggart when he rather unfairly took the piss out of UFO 'believers' (as we are known, a word which brings with it a sense that we're daft idiots who spot UFOs after several pints of strong ale) and politely described the normality of many people who are interested in, or witness, UFOs. He hasn't mentioned the subject since, I'm glad to say, but the rest of the paper remains rabidly sceptical on the matter. I think he comes across pretty genuinely, particularly regarding his childhood experiences. But here's the thing: The reason The Guardian chose to do a splash on UFOs here is that Mr Ryder, no matter how genuine he comes across, is easily scuppered by his drug history. If this was a regular Joe who saw the things Mr Ryder has seen, then The Guardian simply wouldn't have been remotely interested in reporting the case; even if our regular Joe was fronting a rock band (for instance, Robbie Williams). But in the case of the Happy Mondays front man, here's a terrific opportunity to exploit a modern myth about people who witness extraordinary events - that they were high, drunk, or just fools - even if none of those labels fits on the day of the sighting. Because by presenting the subject through the lens of an uncouth, drug-taking rock singer, the media don't really have to try too hard to establish in the mind of the public just what kind of folk 'believe' in UFOs. 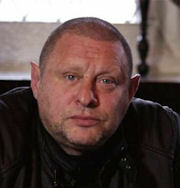 I'm not saying that Shaun Ryder shouldn't talk about this stuff publicly. In fact, I'm very glad he did, and very glad that he discussed the matter in such a candid manner. I just observe the tactics used by the mainstream media to debunk this issue. Perhaps in order to gain credibility regarding their drive to expose government espionage on just about everyone in the world, The Guardian feel the need to 'look serious' when it comes to other alleged government cover-ups. It's a shame. I wish they'd take the time to read the new book by Thomas Carey and Don Schmitt, "Inside The Real Area 51" that I've reviewed this month. No brash rock stars here, just straightforward, sober military types providing death-bed confessions about Uncle Sam and UFOs. Continuing our discussion of the African stone monuments spread widely across southern African lands, as described by Michael Tellinger and Johan Heine in their book "Temples of the African Gods". In a previous Dark Star piece, I indicated that the formations had a striking parallel with similar ancient structures in war-torn Syria - a connection made by my colleague Lee Covino. Lee has been continuing his research into these ancient structures and has discovered a further connection, this time with the ancient Indus Valley. "Stanislas A. Grigoriev’s “Ancient Europeans” (2) offers a theory that the Indo-European migration from the steppe Sintasha and Andronovo cultures (1,800 -1,600 B.C) –from the northern Caucuses and centred perhaps on the southern end of the Caspian Sea, near Tehran - moved through northern Syria and then into India through Bactria. Girgoriev suggests that these people were the ancestors of the Iranians (Persians) and Indus Valley Aryans, whose books the “Avestan” and “Rig Veda” record a common tradition of worship using Soma (Persian Hoama), a sacred, golden drink made from cannabis, which was offered to the gods in ceremonial banquets involving horse and other animal sacrifices. 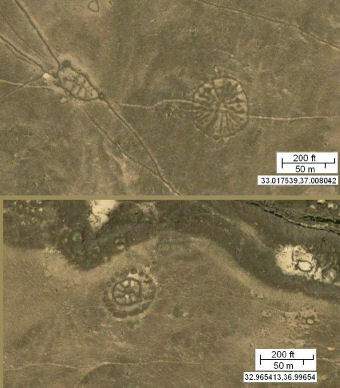 "If we compare the Syrian stone circles (right, top) with the Thalpan altar rock (right, bottom) we can see a similarity in the use of what would appear to be sun symbols. They have multiple spokes, ranging from a simple cross to eight spokes and more complex designs, with dots and rays around the wheels." The purpose of the stone circles in South Africa and adjoining African nations remains a mystery. That they should have a counterpart in distant Syria is remarkable indeed, given how ancient these arid structures are. Now, it seems, that geographical separation needs to be extended out to Pakistan's Indus Valley - a region which features its own remarkable ancient civilisation. From a Sitchinite perspective, this is where things get really interesting because the spread of of these circles shows a remarkable parallel with geographical zones described as being central to the Anunnaki's colony on Earth. Are these structures simply corrals for animals, or stone bases for buildings whose wooden roofs are long since gone? Or do they involve a more technological solution, as speculated by Michael Tellinger? The extensive nature of these structures is remarkable, even if you just count the southern part of Africa. But their spread across the Middle East to the Indian sub-continent (and possibly even the Caucasus, as hinted by Mel Copeland) puts them into an all-new category of ancient civilisation - one that, curiously, is not currently recognised by mainstream archaeology. "Cosmic impacts regularly blast rocks off Vesta. A class of meteorites known as diogenites are thought to come from Vesta's mantle or lower crust, and sometimes possess substantial amounts of a green mineral known as olivine, a major ingredient of Earth's upper mantle. As such, investigators expected to find olivine in places on Vesta where large impacts unearthed deeply buried rocks. The mineral has not been found in the deep basins of the asteroid's southern hemisphere. Scientific theories of the asteroid's formation are becoming more complex in order to reconcile the new data from NASA's Dawn probe. Could it be part of a massive debris field, strewn across large parts of the surface of Vesta? Could that debris have originated from a primordial collision experienced by Earth, as described by Zecharia Sitchin? This would explain the scenario posed by this proto-planet's unusual composition, although academic astronomers won't really want to consider such an outlandish possibility! After all, this involves a collision that took place some 3.9 billion years ago when the Earth, according to Sitchin, was in the asteroid belt's current location. This is not acceptable to science, but the facts may well fit with the evidence, nonetheless. Vesta must have already formed when it was hit by Earth's debris, otherwise olivine would have been consumed within Vesta during the formation process. Any catastrophic event involving Earth must have taken place after Vesta formed. 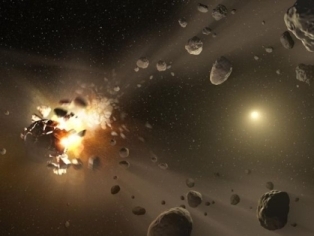 The debris field associated with that event was then vast enough to cover large parts of the surface of an asteroid belt object, meaning that the crustal composition of the asteroid was contaminated by olivine from the Earth's ruptured mantle in a way that its deeper basins were not. This is not beyond the realm of possibility, I think, and provides a simpler solution to the problem posed by Dawn. "The star and crescent appear in combination in finds from in and around ancient Palestine. 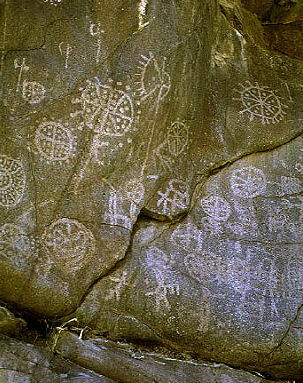 It has been associated with the Moabites (14th or early 13th – 6th century BC), as the symbol or symbols appear on what are thought to be Moabite name seals. (2) Crescents appearing together with a star or stars are a common feature of Sumerian iconography, the crescent usually being associated with the moon god Sin(Nanna to the Sumerians) and the star (often identified as Venus) with Ishtar (Inanna to the Sumerians). However, in this context, there is a third element often seen, that being the sun disk of Shamash. 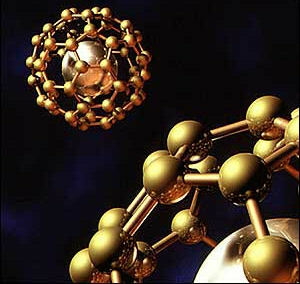 Mark sent me a set of links regarding the use of gold in nanotechnology, particularly for potential medicinal uses. The following links demonstrate the use of gold in exotic, nanotechnology products which may lead to scientific and technological breakthroughs. It seems like early days yet, but there only needs to be one big breakthrough for people to realise how gold might take on central importance in advanced, modern technology of the future (especially as biotech catalysts). And from there, the Anunnaki's interest in gold would become very clear indeed. I had the great pleasure of taking my sons to see the new movie 'Gravity', starring Sandra Bullock and George Clooney. The CGi is breath-taking and the drama tense and exciting, but what I absolutely adored about the film was how forensically detailed the science was. I loved watching how the geography of the Earth below shifted as the clock ticked by, and how the sound effects, or lack of them, reflected the availability of air. There was one part when things suddenly didn't make sense scientifically, but immediately it became clear why. I won't spoil it... This was totally a film to see on big screen in 3D. So, don't miss out...!